This date in 1501,* the Italian city-state of Florence celebrated a “double feast”: that of St. Mary Magdalene, which marked a civic carnival every July 22; and, the hanging of sacrilegious gambler Antonio Rinaldeschi on the walls of the Bargello. 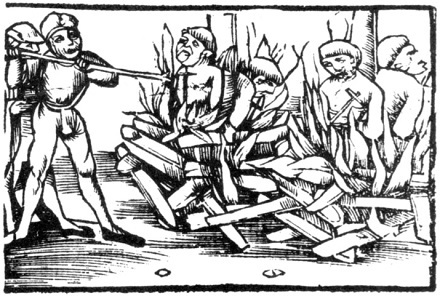 Eleven days prior, Rinaldeschi was having a bad run of wagering at The Fig Tree tavern. Like Jesus is some people’s co-pilot, the Virgin Mary must have been Rinaldeschi’s card-counter — for, stalking out of the premises much the poorer, our doomed punter blasphemously uttered “words that are better kept silent” about her. Then, passing an image of Holy Mother at the piazza Santa Maria de Alberighi, he gathered up some nearby dung and flung it at the sacred pic. This dry poo maybe should have just slid right off, but the Lord works in mysterious ways. a portion of it, resembling a rosette (‘quasi pareva una rosetta secha’), stuck to the Virgin’s diadem, above the nape of her neck. The dirtied image drew much attention. The archbishop came to look. Candles and votive images were brought before the fresco, which quickly became an object of popular devotion. Someone saw something and the trail led back to the ill-tempered cardsharp within days, who tried to stab himself to death when he realized what was about to go down. He copped to the crime pretty quickly (at least one source says it was so that he could be executed in preference to being lynched), and his corpse dangling out the Bargello window decorated the other Mary’s regularly-scheduled homage of parades and horse-races. Florence at the dawn of the 16th century was truly a place where religion could get you killed. This was the city that had elevated severe Dominican friar Savonarola to dictator and morals enforcer in the 1490s (Savonarola especially hated gambling), then overthrew and burned him in 1498. Our authors think there’s some evidence that the first couple years of the 1500s were a period when the populist religious fanatics who once grooved on Savonarola’s violent party pooper act were back on the march as against, say, the more out-of-touch syphilitic reckless gambling blasphemer element that was now, post-Savonarola, enjoying free run of the town. Having one of the latter excrement-ize a Marian monument is the sort of thing that would have led the Florentine Fox News: naturally, he had to be made an example of. 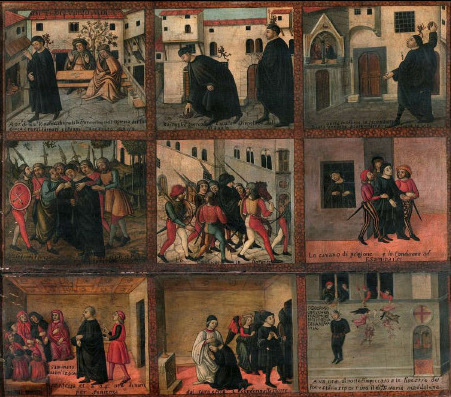 To help you bear that example in mind, a nine-panel painting, “The History of Antonio Rinaldeschi”, attributed to the hanged man’s contemporary Filippo Dolciati, can be seen in Firenze’s Stibbert Museum. Madonna + manure, meanwhile, has its own art legacy … and the combination is still good for raising a ruckus to this day. 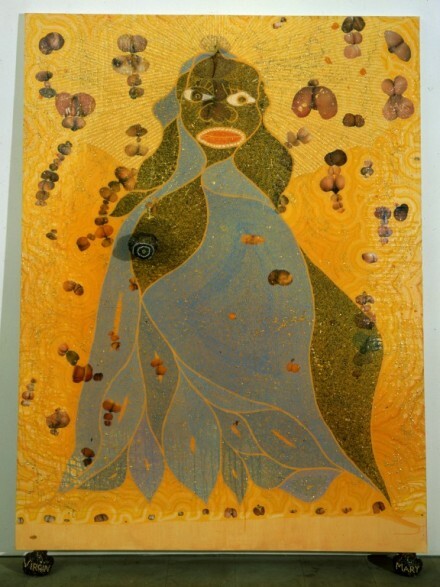 The Holy Virgin Mary, by Chris Ofili: a black Mary smeared with elephant dung. * The primary sourcing on the chronology of the execution is sketchy enough that it’s possible Rinaldeschi was hanged on July 21, before midnight — rather than in the dark early hours of July 22.